Transparency Market Research’s latest report on the global household & DIY hand tools market has assessed such key impediments for the market’s growth over the forecast period, 2017-2026. 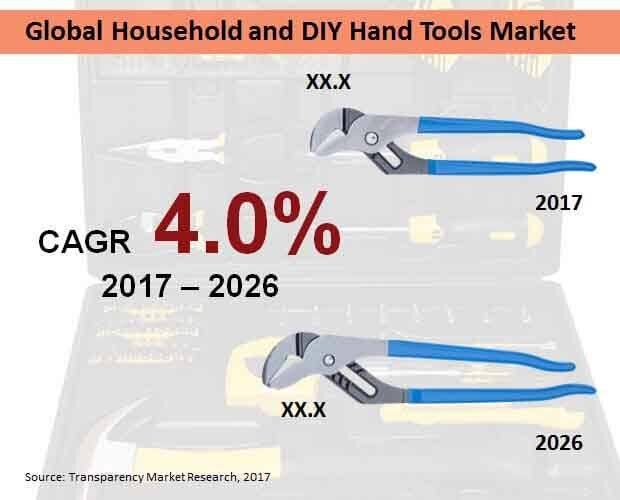 The report projects that the global household & DIY hand tools market will register moderate growth during the forecast period, reflecting a value CAGR of 4%. The report further reveals that by the end of 2026, global sales of household & DIY hand tools bring in revenues worth over US$ 9.1 Bn. The report projects that the demand for general purpose tools will remain high throughout the forecast period. In 2017, sales of general purpose tools accounted for a global market value share of nearly 60%. The report also revealed that the demand for general purpose tools will continue to gain traction for catering to the common use of household & DIY hand tools among consumers. In addition, taps and dies, tools used to create screw threads, will register a significant growth in terms of adoption. In 2017, nearly US$ 1 Bn worth of taps and dies have been sold in the global household & DIY hand tools market. Household & DIY hand tools will be predominantly sold through retail outlets. Live demonstrations and usability tests conducted in retail outlets will factor their significant contribution to the overall sales of household & DIY hand tools. Throughout the forecast period, around two-fifth of household & DIY hand tool sales will be accounted by retail channels. The report further gives insights on the online sales of household & DIY hand tools. Online sales of household & DIY hand tools are poised to register the highest CAGR of 4.5%, and will account for more than one-third share of global market value by the end of 2026. Apex Tools Group, Akar Tools Ltd., JK Files (India) Limited, Channellock, Inc., Klein Tools, Kennametal Inc., Snap-On, Wera Tools, and Stanley Black Decker are the key companies partaking in the expansion of global household & DIY hand tools market. These manufacturers are expected to spearhead the global production of household & DIY hand tools in the years to come. A majority of household & DIY hand tools manufacturers are expected to focus on developing multipurpose tools. However, low profit margins associated with cheap prices and cost-intensive procurement of raw materials will remain key challenges in the global manufacturing landscape for household & DIY hand tools through 2026. Transparency Market Research’s latest forecast study has considered several factors influencing the growth of the global household & DIY hand tools market. The report offers analysis and forecast on the expansion of the global household & DIY hand tools market for the assessment period, 2017-2026. Analysis provided in the report offers presumptive scenarios which reflect the latest market trends and unlock new opportunities in terms of production and sales of household & DIY hand tools. A comprehensive breakdown of the global household & DIY hand tools market makes the report a credible business document for understanding the future prospects of household & DIY hand tools. An executive summary at the beginning of the report abridges the key highlights from the overall research findings. Leading segments and the lucrativeness index is revealed in the executive summary. An overview of the global household & DIY hand tools market is provided in a distinct chapter. This section of the report gauges the changing landscapes of the industrial equipment and automation industry, and showcases the connection of industry trends and household & DIY hand tool market undercurrents. Factors that can transform the global household & DIY hand tools landscape have been analyzed in the following chapters. The report has categorized the drivers for adoption of household & DIY hand tools and the key manufacturing restraints. Qualitative analysis of these factors reveals information which has been in the hindsight of market players. Pricing, cost structure, supply chain and raw material procurement strategies have been analyzed in the report. Key sections of the report provide segmental analysis on the expansion of global household & DIY hand tools market. Product-type, sales channel, and region as the primary segmentations analyzed in the report. The overall household & DIY hand tools market taxonomy has been illustrated below. Additional information on cross-segmental analysis and country-based market size forecast is also provided in the report. The key advantage of availing TMR’s exclusive market study on the global household & DIY hand tools market is to assess valuable information on competitors. Market participants can follow the inferences provided in the report to understand the latest undertakings of their rivals. Each player in the global household & DIY hand tools market has been profiled on the basis of their current market standings. Strategic developments of the household & DIY hand tools market players have been revealed in an unbiased manner, and this information can influence the next steps of companies towards future market direction.